On Saturday morning, the kids and I went to Whole Foods to do some grocery shopping. There in the produce section we found nirvana: Organic peaches are back! We were perhaps a tad bit too happy about their return, but my older son and I are convinced that fresh peaches are one of the best parts of life. I once offered to make him a peach cobbler out of frozen peaches when he was asking for one in November, and he declared that to be blasphemy. I have to agree. Frozen peaches aren’t even close to the fresh ones. Since they are the first peaches of the year, we didn’t buy a ton because I was worried they wouldn’t be good yet, but they were heavenly. We ate a bunch of them raw, and then the boys insisted on cobbler with the rest. 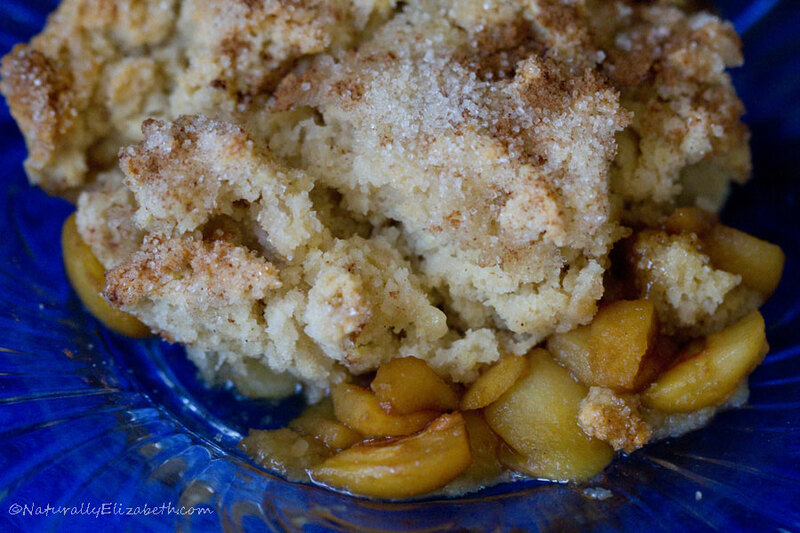 I only had enough to make a half cobbler (baked in an 8” x 8” pan), but they were happy with that. 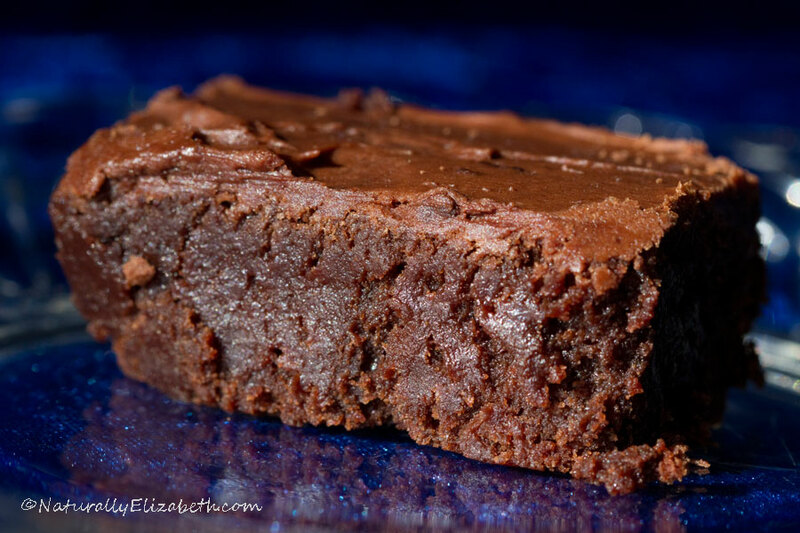 This recipe is an absolute favorite of my boys. 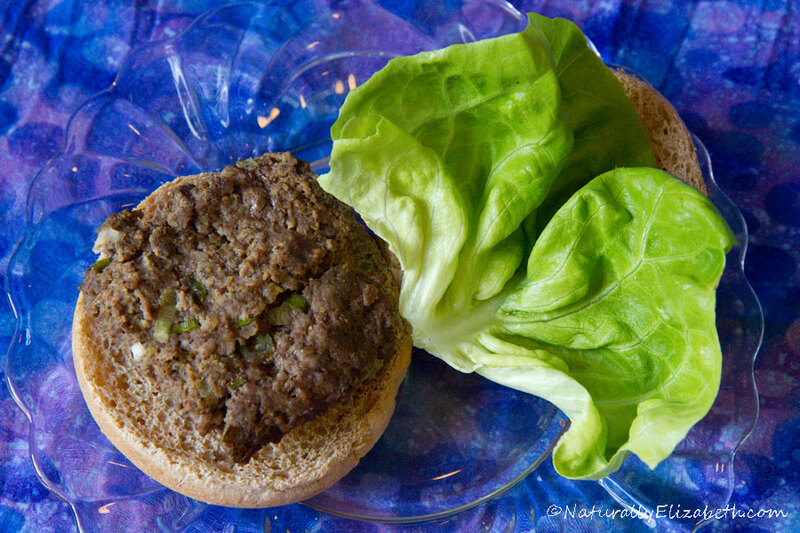 My older son doesn’t like the gluten free version I created, so I still make this version for him during the summer months because it is such a favorite. I love the gluten free version, though, so I will post that recipe the next time we get enough peaches to make it! Preheat the oven to 400 degrees F. Lightly oil a 9×13 inch glass baking dish with canola oil. 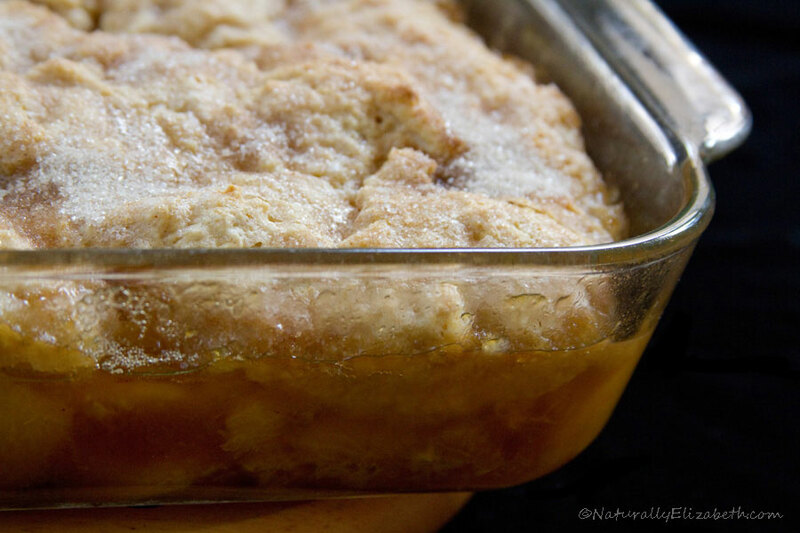 Mix together 1/2 cup sugar, ½ cup sucanat, peaches and almond extract. Place the peaches mixture in the prepared baking dish. Place in preheating oven while making the rest of the batter. In a large bowl, combine flours, 2 tablespoons sugar, baking powder, and salt. Cut in shortening until mixture resembles coarse crumbs. Stir in milk and egg. Carefully remove the peach mixture from the oven and spread the batter over the hot peaches. It will be thick. 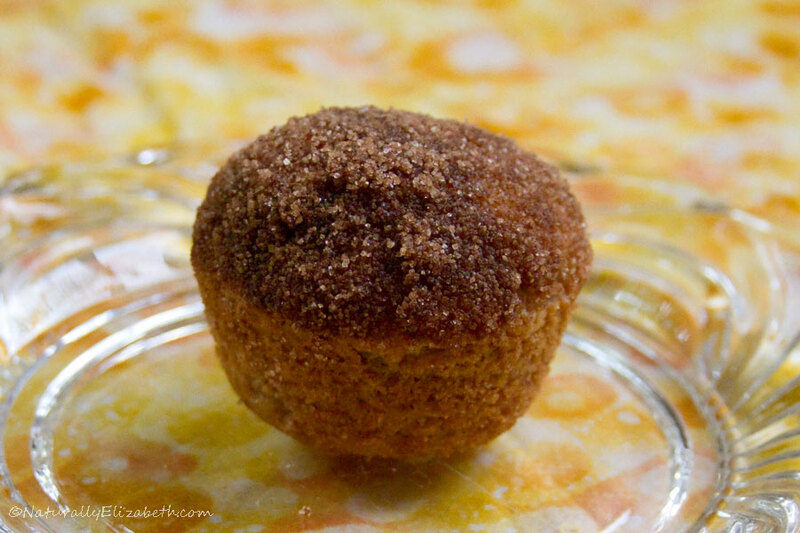 Sprinkle the top with remaining 4 tablespoons of sugar mixed with cinnamon. Bake in preheated oven for 25 minutes, or until top is golden brown. *Omit the almond extract for a nut free version. Last week a friend of mine gave me a bunch of loquats from her organic yard. I had never had a loquat before, so I was up to the challenge of working with them. She suggested cobbler, so that was my plan. What I discovered is that loquat translates into “a whole lot of work.” Wikipedia says that loquats have a 30% or more waste ratio, and I’d say it was more with the small loquats we had. It took me well over an hour with my youngest son helping me for part of the time to get the 3 cups of peeled and seeded loquats we used in this recipe. They started out as 6 or 7 cups of loquats before the preparation. In addition, they turned my fingers very brown– almost worse than cherries! 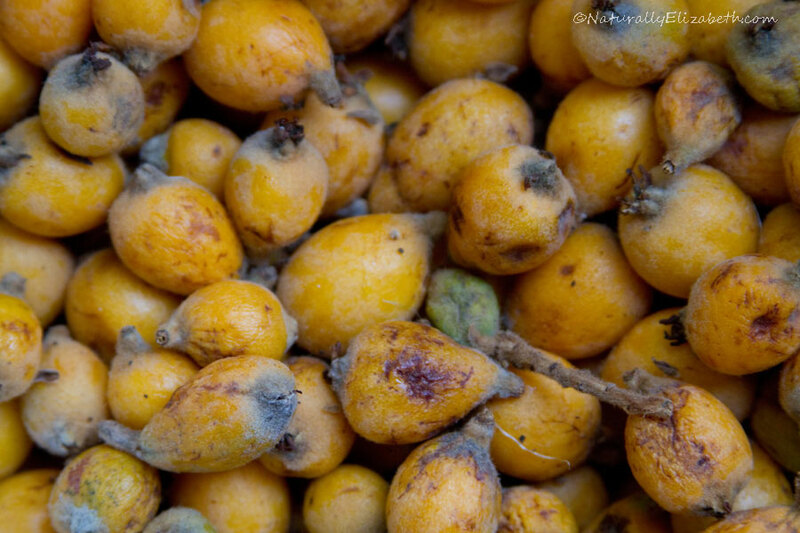 The loquats are good both raw and cooked. My son and I thought that they tasted a lot like plums. Because of how much work it was, this may be a “once in a lifetime” recipe. Preheat oven to 400 degrees F. Lightly oil an 8×8 inch glass baking dish with organic canola oil. 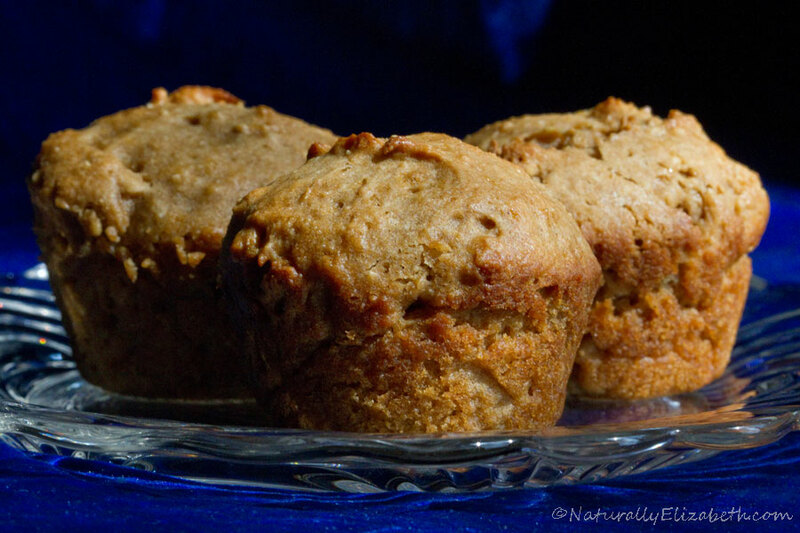 Mix together loquats, 1/4 cup sugar, and 1/4 cup sucanat. Put mixture into the baking dish. Place in preheating oven while preparing batter. 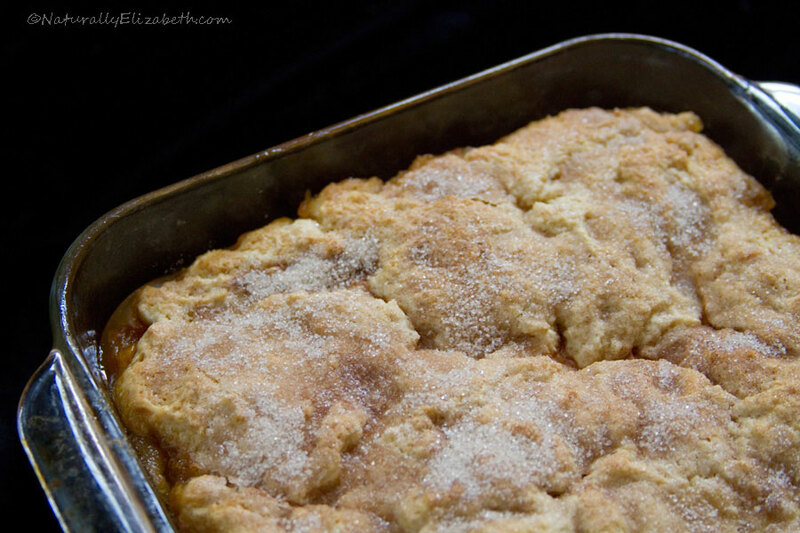 In a large bowl, combine flours, starch, xanthan gum, 1 tablespoon sugar, baking powder, and salt. Cut in shortening until mixture resembles coarse crumbs. Add rice milk, vanilla and egg; stir thoroughly. Remove loquat mixture from the oven, and carefully spread topping across the top. It will be thick. Sprinkle the top with remaining 2 tablespoons sugar mixed with the cinnamon. Bake in preheated oven for 21-23 minutes, or until top is golden brown. *While almonds are not technically nuts, they carry a cross-contamination risk with other tree nuts due to factory processing. 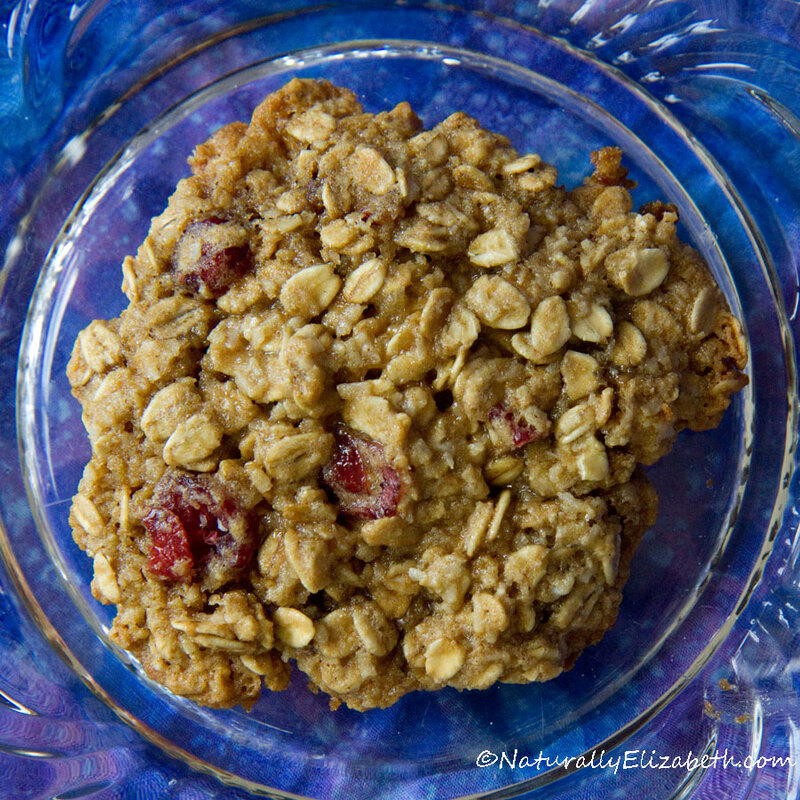 To make this nut free, substitute millet flour for the almond meal. This was inspired by yet another one of my wacky cravings. There are recipes for both a two layer and three layer version of the cake below. Preheat the oven to 350 F. Use some palm shortening to grease the bottoms and sides of two 8” cake pans. Set aside. In a large bowl, use a whisk or hand mixer to combine the sugar, palm shortening, vanilla extract, and eggs. Add in all of the flours, xanthan gum, sea salt, baking powder and rice milk. Use a mixing spoon to stir thoroughly. Split the batter between the two cake pans. Bake for about 28 minutes at 350F until lightly browned and a toothpick comes out clean. Allow to cool in the pans for 10 minutes, and then invert onto plates or racks to cool. While the cakes are cooking and cooling, places the strawberries and sugar into a small pot. Mix the cornstarch into the water and add to the strawberries and sugar. Heat over medium, stirring constantly. Once the strawberries have softened and the mixture is thickened, remove from heat and set aside. Allow to cool thoroughly. 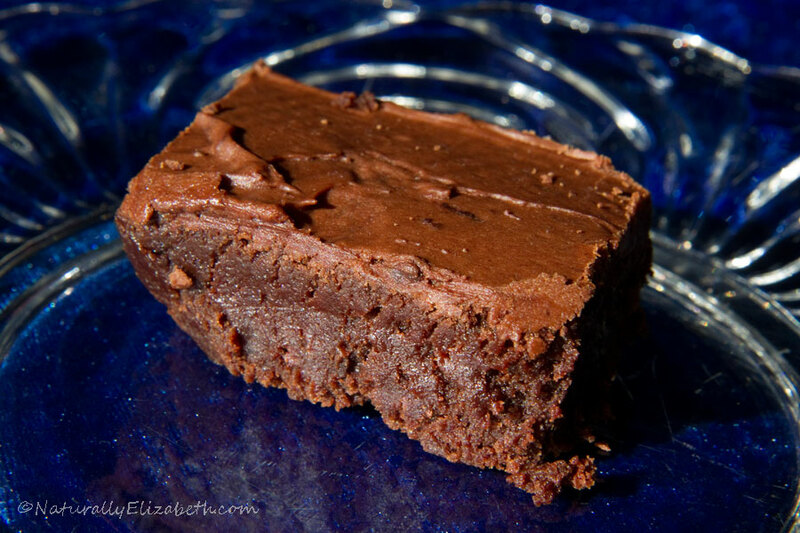 Using an immersion blender or blender, puree the filling to a smooth-ish texture. In yet another bowl, make the icing using an electric hand mixer, cream the shortening into the powdered sugar and vanilla extract, very slowly adding rice milk to get the right consistency. Once the cakes have cooled completely, place one layer on the serving/storage dish. Place a layer of the strawberry filling over the top staying about 1 cm away from the edges. (If you have extra, it works well on toast.) Place the second layer of the cake carefully on top of the filling. Spread the icing evenly across the layered cake. 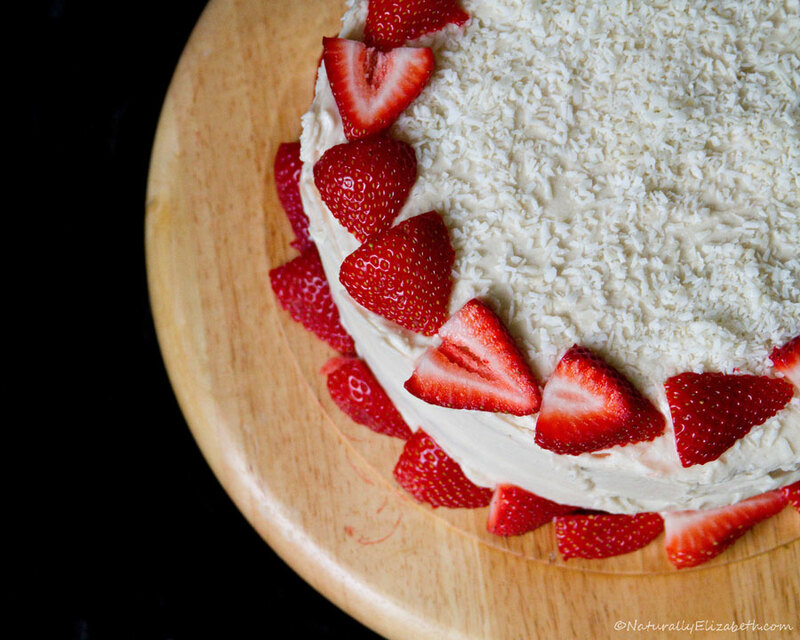 If desired, sprinkle shredded coconut across the top of the cake. Cut the tops off the strawberries reserved for toppings. 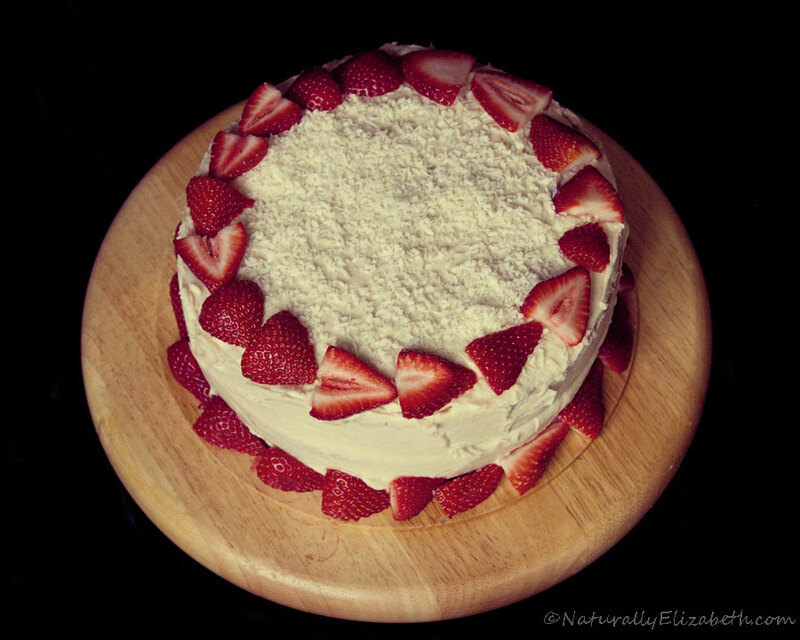 Cut about 4-5 strawberries into slices lengthwise and make a circle around the top of the cake as pictured. Cut another 4-5 strawberries into quarters or sixths (depending on the size) lengthwise and arrange around the bottom of the cake. ** I was using early season strawberries which were not incredibly sweet. If your strawberries are sweeter, you may want to cut the sugar back to 2 tablespoons. ***Do not use the coconut for a nut free cake. Preheat the oven to 350 F. Use some palm shortening to grease the bottoms and sides of three 8” cake pans. Set aside. In a large bowl, use a whisk or hand mixer to combine the sugar, palm shortening, vanilla extract, and eggs. Add in all of the flours, xanthan gum, sea salt, baking powder and rice milk. Use a mixing spoon to stir thoroughly. Split the batter between the three cake pans. Bake for about 28 minutes at 350F until lightly browned and a toothpick comes out clean. Allow to cool in the pans for 10 minutes, and then invert onto plates or racks to cool. Once the cakes have cooled completely, place one layer on the serving/storage dish. Place a layer of about half of the strawberry filling over the top staying about 1 cm away from the edges. Place the second layer of the cake carefully on top of the filling. Spread the second layer with the remaining strawberry filling. (If you have extra filling, it works well on toast.) Place the third cake layer on top. Spread the icing evenly across the layered cake.